Espadrilles are a fairly uncommon style but have recently had a resurgence and look great styled with chino shorts. Characterised by a flat fibre sole (which looks like straw) and a canvas or woven upper, they’re an easy trend to pull off and will give any outfit a chilled summer vibe. 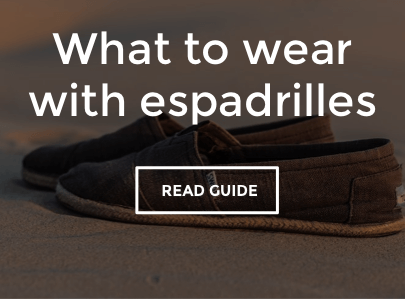 Always wear espadrilles without socks and go for a size down if you’re between so two so they’re not loose. If you have the option, choose a style with an arch inserted into the innersole for extra comfort – they’re pretty flat otherwise.